Writing off bank loans is not a common occurrence, no matter how many loan companies tell you otherwise. However, there are ways that bank loans and other forms of credit can be written off, but these write offs will come with certain stipulations. Recent media reports are showing that banks are writing off nearly twice as many defaulted loans as they were ten years ago. Banks do have the power to write off loans for certain debtors, usually those that have little hope of paying off their loans. But although the bank may write off the loans it does not mean the debt will disappear completely. Banks may pass off their written loans to debt collection agencies that will then pursue the debtor. Debt collection agencies have very limited powers when it comes to collecting debts, although they will say otherwise. If the borrower still refuses to pay the debt then the only option for the debt collection agency will be to pursue them through the court system. In reality, although they may threaten court action, it will actually depend on the size of the debt and whether or not it is worth the debt company's time and money to use the court process. But if the courts are not used this still does not mean the end of the debt as far as the debtor is concerned. 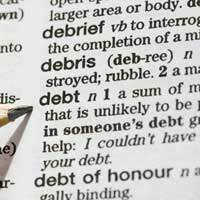 Although the debt may have been written off it can still follow the debtor for many years. The written off loan debt will be marked on the borrower's credit file and can stay on the file for up to six years. Borrowers will find it very hard to obtain more credit with such a black mark on their credit file. Lenders will view the borrower's credit file and use this to make their decision as to whether to lend more credit. When the student reaches 65 if the loan was taken out before September 2006. The loan will be written off after 25 years if it was taken out in September 2006. If the borrower has a medical condition that prevents them from permanently working including permanent disability or illness. The writing off of bank loans is not usually an option for the average borrower. However if debts have become uncontrollable and there is no hope of paying them back then they can, at times, be written off. Recently the Citizens Advice Bureau has made headway with lenders in having bank loans written off for borrowers in extreme debt. This has been a slow process and the number of written off bank loans is low, but it is worth contacting the Citizens Advice for information. There are many companies on the market that do claim to be able to get banks to write off loans. This can be achieved but it is not a case of the bank simply writing off the loan. It may take the form of an Individual Voluntary Arrangement (IVA) where a legal agreement is made between creditors and debtors, and money will still need to be repaid. An IVA should cut debts to a manageable level but it is not strictly writing off debts. In some cases bank loans have been written off due to irresponsible lending. Banks and lenders that supply loans with no concern for the present debt commitments of the borrower can be held accountable. The ultimate consequence could mean the writing off of banks loans. Irresponsible lending has become a hot issue and is seen as one of the reasons for massive personal debts. Bank loan regulators such as the Financial Services Authority can be contacted if it seems irresponsible lending has been used. Although the writing off of bank loans is not a hugely common occurrence it does happen. For the banks, these write offs are a drop in the ocean with regards to their profits. Any borrower who feels their debts are becoming uncontrollable should seek advice from their local Citizens Advice Bureau or from the Consumer Credit Counselling Service.